Getting your pet out and about for some exercise is an important responsibility. Without adequate exercise your dog could become bored, lazy and begin to gain weight. Did you know it works the same way with his brain? Well, not exactly the same, but your dog does need mental stimulation in order to keep his brain active and healthy. Mental stimulation for your dog can come in many forms – puzzle toys are one of the best and easiest! I love my job. It challenges me every day and comes with a lot of perks. One of the best opportunities that this job provides me with is the ability to sit down with professionals in the pet industry and talk with them about their field. This week, I was fortunate enough to be able to speak with and learn from Nina Ottosson, one of the most well-known dog toy creators in the industry. Her journey started back in 1989 when her two children were born a year and a half apart. As you can imagine, Nina did not have time to activate her dogs the way they, and she, were used to. At the time she had two Bouvier des Flandres that she used to train and compete with. She still raises Bouviers. Nina's conscience got the best of her, and it's a good thing it did. It made her start thinking about how she could activate her dogs in a simple, fun and varied way indoors with her kids. Since 1990 she has worked with the development and design of dog activity toys and games that stimulate the dog mentally, also known as “brainteasers” for dogs. Nina told me that there were many skeptics when she first introduced this new and unique category of dog toys. A lot of people, especially dog trainers and psychologists, were excited to get these great tools for training and mental stimulation though, and her business has been growing ever since. People even called me the crazy lady who thinks dogs can and want to play with puzzles. She has always activated her dogs a lot, with tracking and other brain building exercises. Nina explained that the games she creates have been great for entertainment for her younger dogs, and they are also excellent to use when the dogs have gotten older and can’t be as physically active – not to mention the great daily use when she and the dogs are at her office! Nina Ottosson Dog Toys make great slow feeders as well. Nina's dogs have always gotten their food in one of the games or toys. She says that she thinks her dogs, as well as a lot of other dogs, have had healthier, happier lives because of these products, and that’s makes her feel great and very proud. My first question for Nina was an obvious one…what is the importance of mental stimulation for your dog? She said that her mission has always been to get the message out to as many people as possible about the importance of mental stimulation for dogs. Dogs have four legs and one brain, and all five need to be activated. She says that many so-called “problem dogs” are actually just bored. There are so many benefits of Nina Ottosson Dog Toys, especially for a busy household. By investing just 10-15 minutes a day in mentally stimulating your dog, you will have a happier dog that creates less problems around the home. If the dog is sufficiently stimulated and activated, it’s easier to leave him alone during the day. It’s also easy to activate the dog with these products both outdoors and indoors. The games are designed to be played interactively with the dog, but you can also activate the dog while you are doing other things such as cooking or watching TV. These toys are also a great tool for children to interact with dogs in a safe way. Just remember that as with all treat dispensing toys, Nina Ottosson Dog Toys need to be used under supervision. Dogs, as well as cats, really need to use their brain, and they don’t get to do enough of that anymore. Their natural instinct is to hunt for food, but we serve them their food in a bowl. So many dogs and indoor cats are bored. Your dog is much happier and healthier if he gets to use his brain. It can help prevent a lot of behavior problems such as chewing, barking, hyperactivity, obesity and more. Most dog owners don't realize that allowing their dog to burn off energy isn't just a physical thing – it's mental too. Nina did remind me that, just like physical exercise, there is such a thing as too much mental stimulation for your dog. She says that being active is just as important as being passive – the key is to create a balance of both. You can be active with the dog for 15-30 minutes, and then let him rest equally as long before you do something else. Nina's toys offer something that other puzzle toys for dogs don't offer. They provide mental stimulation by problem solving. The dog must use his brain to find the rewards. It's not like a traditional dog toy that only involves play, and they are much more challenging than other similar treat dispensing dog toys. One thing you'll need to consider when purchasing these toys is that your dog isn't going to know how to use them right away. It's not like a ball or a stuffed toy that your dog will be able to pick up and play with immediately. Nina says that you need to sit down and play together with your dog. Be patient and show him what he is supposed to do, and use a lot of positive praise when he dose it right. She says that it is hard to generalize what game your dog should use, because it depends on many factors. For example it varies depending on your dog's experience level, what activities he has done, how food-motivated he is, and what kind of breed he is. All of the games she creates are leveled from 1-3. Beginners and puppies may want to start with an Easier (Level 1) game such as the DogSmart or DogSpinny. These toys have basic functions such as lifting blocks and turning discs. The DogBrick and DogTornado are Medium (Level 2) games, that you can vary from easy to a little more difficult by adding blocks. The DogCasino or the DogTwister are Advanced games (Level 3) with 2-step problem solving to reach the treats. Keep in mind that these are not chew toys. They are more expensive than other traditional dog toys, because they are much more versatile and your dog is getting a lot more out of them. Therefore, you should not leave your dog unattended with a Nina Ottosson toy even for a minute until you know how he'll play with it. Nina also shared a great treat for keeping your pet busy even longer with her toys. She says you can make an ice cream for your dog by mixing meaty dog food with water, and then put a small amount in all the toy compartments and freeze it. Your dog will be busy for a long time! If you're on a budget and you can't afford a Nina Ottosson dog toy right now, there are ways to mentally stimulate your dog in an easier way. Instead of throwing a ball, try to make the dog sit and stay while you walk away and hide the ball in the grass or behind a bush or even indoors. Then let the dog search for the ball. Nina says that you should do this a few times and hide the ball in different places, because dogs are creatures of habit and will start searching where they last found the ball. This will make sure your dog is tired because he has used his head by nosework, and not just his legs by chasing after the ball. 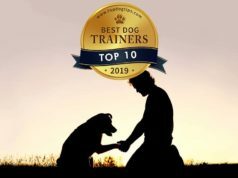 I need to send a huge thank you to Nina for sharing her knowledge and advice on the importance of mentally stimulating your dog with me and our readers. Remember to check out Nina's website at Nina Ottosson Dog Toys, and let us know what you thought of this interview on puzzle dog toys in the comments below! Previous articlePet Obesity: Is Your Dog Adding to the Statistic?